Comprehensive South Caucasus scheduled group tour 2019 offers you well-managed and balanced travel itinerary. The 15-day tour is combined of itineraries in Azerbaijan, Georgia and Armenia. And is scheduled to run monthly starting from March 24 through to November 2019. Our travelers named this tour back in 2018 – the best offer found online. Meaning that it is impossible to find the same value program for the same price. Take our “South Caucasus scheduled group tour 2019” and you will see how three countries are so close to each other and at the same time are so different. Beautiful nature, fascinating history, amazing architecture, ancient hospitality traditions, and unique cultural distinguishing features – this is the least you should expect from tour to Azerbaijan, Georgia and Armenia. This is a small group tour for up to 12 travelers at a time. So it will not feel too crowded and everybody will get the service and attention of our travel consultants and guides. The tour program also includes one free day in Georgia for travelers to explore Tbilisi on their own. Check the Caucasus tour itinerary in details below. Then choose the most suitable dates for your travel from the Tour calendar. And submit the tour request form. Looking forward to welcome you in the South Caucasus. Our representative will meet you in Baku international airport and arrange for hotel transfer. Check-in to the Hotel. Free evening. Depending on the time of your arrival, our consultants will help you to arrange for a table in one of the local restaurants (upon request). Your Georgia tour will start with the region of Kakheti famous for its ancient winemaking traditions. And the first Georgian experience will be a freshly made lunch in local family house. After which you will be transferred to the hotel for a long lazy and relaxing evening in the amazing natural surroundings. Overnight. Continue Kakheti tour. Numerous vineyards as well as both big and small wine producing facilities are biggest landmarks of the region. Arrive to the 5thcentury Zegaani monastery, nested in the middle of green oasis in the middle of Alazani valley. Continue exploring the region by visiting local family producing wine of indigenous grape variety called Vakirula. Next stop before driving to capital city Tbilisi will be the town called Sighnaghi, labeled recently as a “city of love”, mostly for the fact that one can register there their marriage 24/7. Previously a royal residence, Sighnaghi still surrounded by ancient city walls and currently one of the most popular travel destinations in Georgia. Drive to Tbilisi, check-in to hotel. This day of the South Caucasus group tour is for you to spend on your own agenda. Please kindly note that no guide and transport will be provided for this day. You can also choose one of our day tours in Georgia itineraries, which are not covered by this Caucasus tour. Check-out from your Tbilisi hotel in the morning and depart towards the border between Georgia and Armenia (about 1.5-hour drive). On the other side, you will be met by local guide and driver to start touring the last destination country of the Caucasus tour – Armenia. The first Armenian site to visit is Haghpat monastery, the X century architectural monument and UNESCO World Heritage list member, in the region of Lori. The next attraction of the tour is what is called a Jewel of Armenia – lake Sevan, the largest freshwater alpine lake in Caucasus and Eurasian region. Total surface area of the lake is 1900 square miles which comprises a sixth part of Armenia. 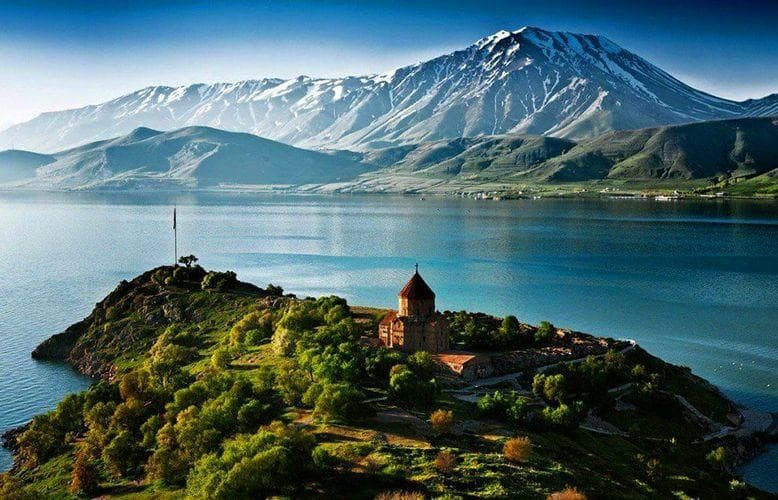 Arrive to Sevanavank (Sevan monastery), ancient monastic complex which beautifully set in one of the coasts of lake Sevan and features two major churches – Surp Arakelots (Holy Apostles) and Surp Astvatsatsin (Holy Mother of God), founded in the year of 847 by Princess Mariam. Another distinguishing feature of the site is a magnificent view that surrounds the place – snowy mountains everywhere your eyes could see. Arrive in Yerevan, check-in to hotel. Sightseeing tour of Armenian capital is yet another exciting day of your travel to Caucasus. You will see how different it is from two previous capitals, especially with its colors – Yerevan has a distinguished color in its basic architecture (spoiler: it’s pink!). This city tour will start with probably the most adventurous part – Cascade Monument. Interesting fact about this place is that it has 2780 stairs to walk up, exactly the number of years Yerevan has celebrated recently. Walking up these stairs does have its reward – a fascinating view over the city, with gorgeous Ararat mountain, central square of Republic, major city avenue and beautiful Opera theatre building – all in a magic full view. And, as usual, the city tour of Armenian capital will complete with the national cuisine dinner and traditional folklore show. Transfer to hotel. In the morning leave Yerevan for the Armenian village called Garni with its principal highlight – ancient pagan fortress of the I century BC. Drive to Geghard, IV century medieval monastery partially carved out of the adjacent mountain, and yet another UNESCO World heritage list site. Continue to the see of Vagharshapat and visit the Etchmiadzin Cathedral, known as “mother-church” of the Armenian Apostolic Church and residence of the Catholicos of All Armenians. Drive back to Yerevan, transfer to hotel. After breakfast continue exploring Armenia by driving to Amberd – rare historical site that survived and reached us in a good condition from the 7-th century. Some say that it was built in the 11-13th centuries, attributing it to the near located church. Amberd means ‘fortress in the clouds’; the name is due to its location 2300 meters above sea level. Then continue the tour to Karmravor – the most well-known historical site of Ashtarak constructed in the 7th century from large square stone blocks. A small cross-shaped church has a porch facade. The legend says that the name of the church symbolizes dress colours of three sisters who committed suicide after falling in love with one man. The final stop of the day is Oshakan, which is known as a burial place of the father of the Armenian alphabet Saint Mesrop Mashtots. A cathedral named after him houses his grave which was rebuilt by Catholicos George IV in 1875. Drive back to Yerevan. Standard accommodation is provided in comfortable Boutique-type hotels, based on Double or Twin room occupancy, breakfast included. Single travelers requesting a separate room are subject to additional Single supplement charge. Please kindly add this information in comments section of the tour booking form. Please note that deadline for booking a place is 2 weeks prior the group tour start date. Single room supplement is 610 USD. ALL INCLUSIVE 14-day group tour to Georgia – is the best option for those travelers wishing to visit Georgia. Look no further as you have already found a perfect Georgia tour program.